The MGM-owned Mirage Hotel and Casino may be one of the more recognizable names on the Las Vegas strip -- but this carefully-constructed fantasyland getaway is host to a little-known, yet completely disturbing reality for ten animals who are held as living props for the resort's Polynesian theme. For the last two decades, the Mirage has kept bottlenose dolphins in two open-air pools tucked away on the hotel grounds. A few times a day, they are made to perform tricks for small crowds of guests, though mostly they swim restlessly, without stimulation and only little respite from the sun's intense rays and the desert's scorching heat. Since the dolphin pools first opened at the Mirage in 1990, twelve of twenty-two dolphins have died -- a mortality rate of 55 percent -- mostly from conditions attributable to the stresses of their wholly unnatural setting. 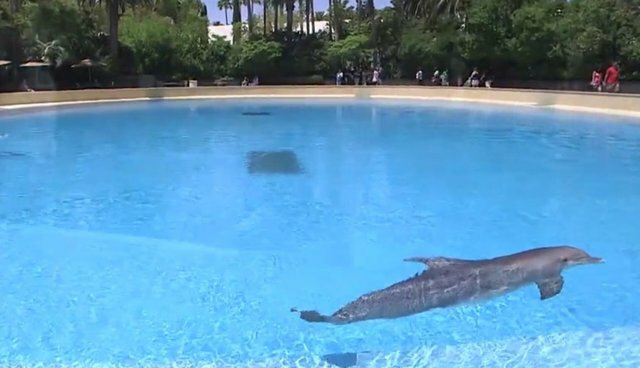 In a twist of bitter irony, given the animals' wanton conditions, the Mirage even offers Yoga With Dolphins, allowing paying guests to unwind with the discomfortable captives. According to Ric O'Barry's Dolphin Project, the governing body which oversees animal welfare in the U.S. has largely neglected to inspect the Mirage's animal facilities. But now the word is out, and it's spreading. Join the Free The Mojave Dolphins movement by adding your voice to a petition calling for MGM to close the Mirage's dolphin pools of death. The Mirage Hotel's dolphin program has earned itself the nickname "Dolphin Death Pool" -- and that's exactly what it is. The luxury resort's captive dolphins are suffering from high mortality rates, cramped quarters and the harmful effects of the Mojave Desert's scorching heat. Please join us in pressuring the Mirage Hotel to phase out their dolphin program for good!